I finally got around to doing this project this winter. I purchased a FX-r kit from theretrofitsource.com and this is where I'm at right now. I looked at other threads that this had been done on and thought it didn't look that hard so to work I went. I cooked it in the oven so I could pull the cover off and with everything apart all the previous builds I had read went right out the window. I thought why hack the **** out of the stock reflector bucket and then glue the projector to it and then replace everything. 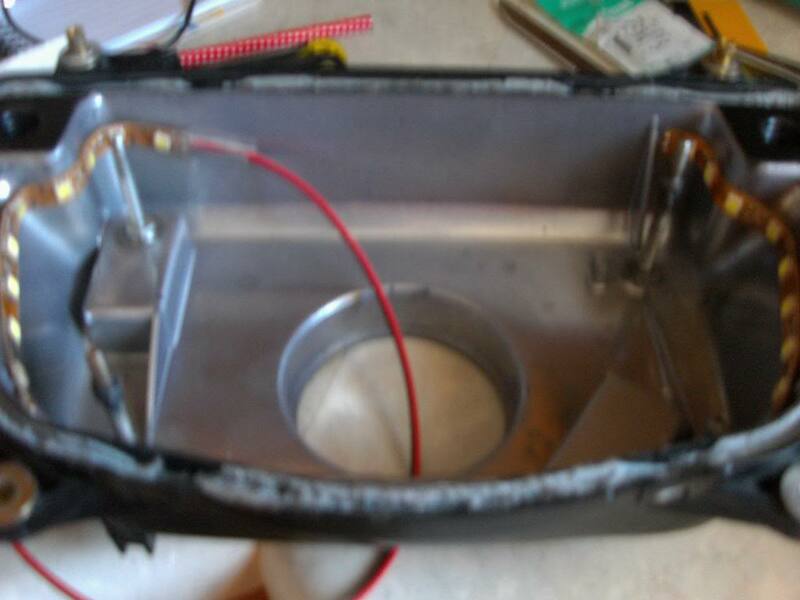 I saw a stock housing that all I needed to do was fabricate a 1/4" aluminum plate to glue in the housing and bolt the projector to it, thus scrapping the need for the stock reflector bucket and the inner shroud. In the process of figuring out how I wanted to do the plate I thought I could waterjet cut the plate and projector cutout then thought I had additional space to add some design to the side and back light it with an LED strip. I Sprayed the inside of the housing with a chrome paint to aid in reflecting the light and painted everything else satin black (I'm still considering covering the painted plate with carbon fiber to smooth it out even more but still pending that decision). The waterjeted plate after painting. The housing with cover on and backlight on, the light showing through the projector on the last pic is just the back lighting showing through. Ahhh but there is a method of adjustment...... The most imprtant thing I did want when setting it up was the possibility of adjustment, especially after installation and sitting on the bike. I have threaded lugs, same as what is on the back of the stock reflector housing, to weld to the back of the plate, thus enabling adjustment the same as you would do if stock setup. There was absolutely no way that I wanted to spend all kinds of time mounting, checking adjustment, dismounting,unsealing, adjusting and remounting the headlight over and over to get it dialed in. Although it would be possible, it would just way to redundant and time consuming.......I have other things I could be doing. Last edited by archaicguy; 02-22-2013 at 04:44 AM. Really fraggin cool... although I almost like it better with just the backlight blade lines and no angle eyes... I bet it's cooler in person. Thats pretty good looking and smart to include a way to adjust it as well. I like the backlight effect as well, nice job. Question, any reason you chose the fx-r kit over their motorcycle specific kit? Curious as I am thinking of doing this as well in the near future, any input appreciated. Last edited by Mikael; 02-22-2013 at 10:06 PM. ok some updated pics on what was done for adjustability. The stock housing bolts have been modified to make longer and another added entirely, all screw into the t-nuts that are on back of the mounting plate and now allows for finite adjusting in 3 positions. Turned out good in my opinion, should be bad *** when reassembled and installed. The motorcycle kit that they have would allow a nice easy install and would be much better than stock but I wanted to get the best unit available so I went with the FX-r unit, and what what i had read was that it was the best unit they had. Now finished and only need to finish tucking away wires and put screen back on. Very awesome job. How is the light on the road compared to stock (if thats what you had). I really want this mod in a someday kinda way. I am half concerned of reduced conspicuity due to the cutoff line of the light. Any pics of the light it produces down the road? I have not gotten it out to test it on the road yet but I have no doubt that it will be a major improvement due to the others that have done it and their results. Have you got a template/CAD/dxf for the water jet plate? I really like this conversion! I do have a DXF file that I used for the slots and overall shape. Any holes for mounting the projector and tee nuts were drilled by hand. Last edited by archaicguy; 04-07-2013 at 05:02 AM. But you're not prepared to share that with the forum! "I'm sorry for any misunderstanding but I spent quite a bit of time working the plate up and really have no intention of just giving it up to any others that are interested in it. Sorry"
Gobsmacked - I thought the idea was to help each other! what projector did you use ? I used the FX-r Projector setup from the retrofit source. Couldn't be happier with the projector, although leaning in turns doesn't leave much light on the edge. I did help out anyone that was interested in doing something similar with their bike by giving the information on the process and items used. I DO NOT THINK I SHOULD HAVE TO SUPPLY THE ITEMS USED to be of assistance. I did do a setup for another local hawk rider that lives near me and I know well for no cost but he bought any items needed. 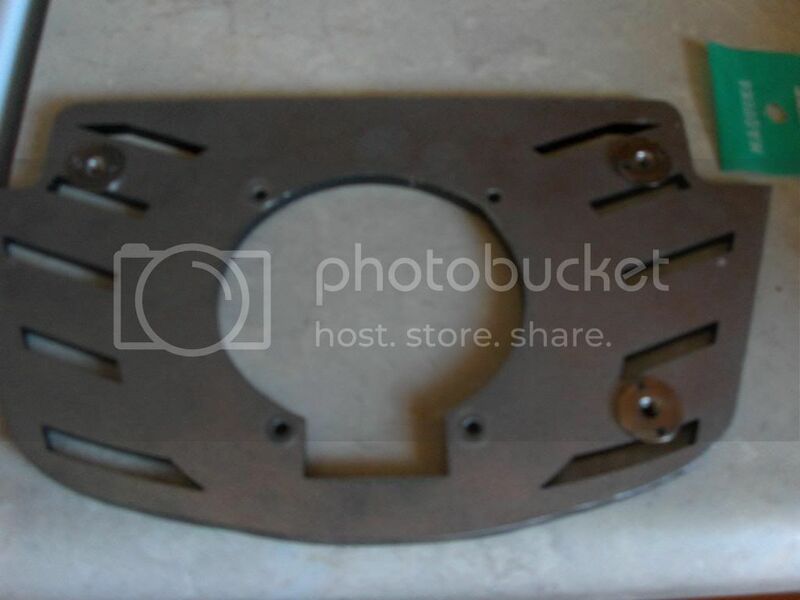 I have no issue with helping anyone out and supplying a plate for someone that I know or has helped others out as many of the forum veterans have done but I will not supply the information for anyone that may attempt to sell it and turn a profit for themselves as you obviously have access to a waterjet and know cad and dxf files. Not to say that you would do that. You may be a stand up guy and I probably would have given you what you wanted after I got to know you a little better but with only 3 posts I'm not sure of your intentions. Not much I can do if someone doesn't understand that. Last edited by archaicguy; 04-08-2013 at 05:26 AM. 3 posts on this forum, yes - many, many more elsewhere. Do I have to pass a rite of passage before you, or others will talk to me. Am I at 50 years old, with 34 years of motorcycling, too young/to old/too inexperienced/too experienced to be worthy of the pearls of wisdom that fall from your mouth. "WHEN GOOD INTENTIONS GO BAD"
As in - I've got a Template, but you can't have it. My day will be fine, thank you for the good wishes sir. On a lighter note, I would love to do this mod but with 2 lights. Kinda give an RC30 look. Dont know why but I always liked the dual light look. Any of you guys who have done this think there is room? There's a company that used to make a dual headlight setup, not sure if it's still available but I think the company was powerbronze. I had seen pics of it and it looked good. I actually was hoping to keep the stock fairing and adapt the stock housing liike archiac did. Its like you said though, sure to be alot of work but not sure of the payoff. With my race season starting, there wont be much superfluous wrenching time. I guess I just hate reinventing the wheel - I can't afford to take the bike off the road, and don't have the money or time to buy a second unit to strip down, nor the luxury of a garage. All I was after was a template that I could do a feasability study - and if it worked, get the piece cut - and parts ready to go. Jeez, it's like a bunch of 12 year olds hiding their work.